A Japanese Workbook for students in their first year of Japanese. Covers beginning Japanese grammar & topics: Introducing Yourself & Others, Numbers, Telephone Numbers, Birthdays, Days of the Week, Classroom Objects, Giving & Accepting Things, Telling the Time, Sports, School Subjects etc. 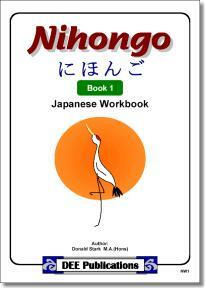 Nihongo Workbook 1 complements Nihongo Reader 1. Photocopiable black-line masters, 40 A4-sized pages. Class sets are also available.